THE REVIEW: My 365th films of this marathon — aka the last film of my first year — was the first Now You See Me. I decided to finish the year with a movie in theaters and, being a fan of magic tricks, decided the film would pique several of my interests. I enjoyed the film immensely because of the magic and misdirection that was so masterfully done. The magic is/was so over the top it lands in the realm of impossibility, but the acting and directing carried the film throughout and produced an enjoyable piece of entertainment. Looking at these elements in the sequel, so are even more over the top. Now instead of being in the realm of impossibility but still cool enough to blow your mind and make you think they’re possible, they turn it up to 11. Some are also superfluous as well, like the whole card throwing sequence when the Four Hoursemen are trying to steal “the stick” — some fancy computer chip that can steal any information anywhere. The card throws are indeed impressive and no doubt some are possible in real life (people who can control a deck of cards make it look easy). However, the scene is drawn out for seemingly no good reason other than to show off their amazing skills and the CGI skills of the computer graphics people behind the scenes. It just becomes too much and too over-the-top in a way the original film knew how to restrict itself. My biggest criticism in the original film had to do with the “in-between sections”, probably better described here as the background to the story. While I enjoyed the plot of both films, it’s the background and bigger-picture ideas that I’m not as big a fan of, and Now You See Me 2 seems to have doubled down on them and made this part worse as well. The biggest example of all this is the secret organization, “The Eye”, which the Four Horsemen follow and receive their marching orders from. In the original it was present and showed up constantly, but it was quickly forgotten so you could mostly ignore the ridiculousness. Sorry to say the same isn’t true for this film. The Eye is also turned up to 11 here and becomes this sort of paranormal type voodoo thing which the entire film revolves around. It’s distracting, takes you out of the cool magic you’re otherwise watching, and leads you down an unfulfilling path. Now You See Me 2 does get better and correct some of these problems at the end by providing clarity to some of these elements, but overall it’s too little too late. While it still is an enjoyable film to watch and keeps me wanting to come back for more, that’s probably just because I’m a sucker for magic films and would see any on a whim. 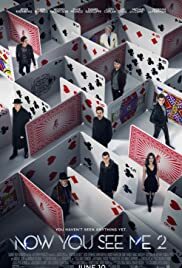 So while I could recommend the original to most people, Now You See Me 2 should only be seen by the die-hards or those interested in seeing some cool stuff on screen for two hours.